Virgo Sun and Pisces Moon – it’s a Five of Cups day – UGGGHH! With the sun in Virgo (critical and self-conscious) and the moon in Pisces (penitence and forgiveness) today and tomorrow are Five of Cups days. But with Virgo, it doesn’t stop there. Virgo is the efficient, effective problem-solver who, like the great Belgian detective Hercule Poiret never misses a trick. Virgo does however often miss the forest for the trees, and when her blunder is uncovered, she berates herself mercilessly for having done so. On the other hand Pisces never misses the forest for the trees even if she does miss a few tricks. And she’s doesn’t berate herself for it either – instead she slips into an abyss of guilt. 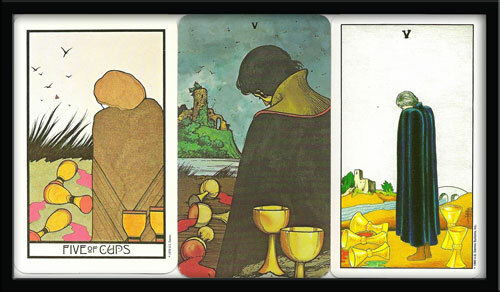 On a divinatory level, the Five of Cups implies regret over past actions. Something has gone wrong – we feel betrayed and abandoned by one whom we thought we could trust. Even worse, at some level we know we ourselves have played some part. Our first impulse is that of Virgo, to hang our head in shame and slink away in silence into the night. And certainly if we’re feeling critical and self conscious that appears the perfect solution – perhaps the only solution – until by chance (or design) we turn to take one last look and discover that although three cups have fallen, their blood red wine seeping untasted into the thirsty ground, two full cups remain. Sceptical, critical Virgo would likely wrinkle her nose up in distaste and walk away. She’s discriminating enough to know that whatever is left behind couldn’t be half as good as what she’s lost. But what would Pisces – the poet, dreamer, and artist – do? The byword of Pisces is compassion. The job of Pisces is to see the bigger picture; the forest is made up of individual trees. However bad she’s feeling, in her heart Pisces knows it’s only through compassion – for her and for those who have hurt her – that she can transcend guilt and find forgiveness and with that comes well-deserved peace and rest. Yet however sensible this sounds, it isn’t as easy as it might seem. All languages deriving from Latin form the word ‘compassion’ by combining ‘with’ (com) and the Latin word for ‘suffering’ (passio). So compassion literally means ‘with passion’. We are not meant to stand by passively and witness suffering, we are meant to participate passionately in some way. But another word with approximately the same meaning is ‘pity’ (French, pitié; Italian, pieta), which implies condescension toward the one who is suffering. ‘To take pity on” a someone suggests we are better off than he or she and boy, do we know it. So although when we witness suffering we not only passionately participate –we also experience highhandedness – a Virgoan criticality – a tone that makes the skin of the person who is suffering creep. Yet in languages not deriving from Latin, for example Czech, German, and Swedish – the word compassion is translated by a noun formed of an equivalent prefix of com with a word that means ‘feeling’ (sou-cit, Mit-gefühl, med-känsla). Here there is little suggestion of our Latin highhandedness. Instead the word-equivalent of “compassion” takes on a tone of equality. Instead of pitying another – we enter into their suffering – we share their pain. To do this, we must develop our capacity for imagination. The art of emotional telepathy requires us to move past the individual trees to the forest of suffering of all mankind. And on a Five of Cups day, this is precisely what we’re meant to remember. It’s the Virgoan energy that makes us self-critical. But it’s the Piscean energy that allows us to move past that and heal. Today and tomorrow, don’t just turn your back on those three empty cups. True, they are gone forever. But if you can practice emotional telepathy on yourself – you just might pluck up the courage to look inside the two cups that remain. For astrology buffs, the Moon in Pisces at the time I’m writing this is conjunct Chiron/Neptune in the 6th house opposite the Sun in Virgo the 12th. To my mind, this is an apt portrait of the draining self-pity- and potentially healing – energy that I’m addressing in this blog. 25 August 2010, 7:34 AM, Oxford, UK. (BST).